Stormtrooper-costumes.com - Helpful Questions and Answers on buying Stormtrooper Costume Armour. 262 Church Road, Next to McDonalds Target Roundabout. Northolt, Middlesex, London, United Kingdom, UB5 5AW. Will I receive an order confirmation email? Can I track my order once I have paid? Are my personal and payment details secure? What if I receive a damaged item or I receive an incorrect item? What currency can I use to pay? I have forgotten my password and am unable to log in. Why open a Customer Account? Can I get more information about returns, refunds and cancellations for Stormtrooper Costumes? I still have an unanswered question. 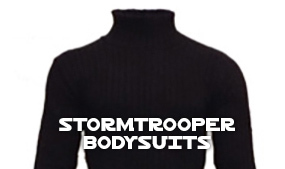 What is included in a Full Stormtrooper Costume? 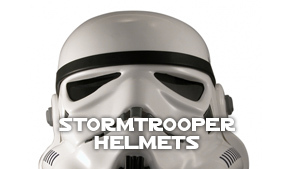 What is included in a Stormtrooper Kit? Will buying one of your costumes get me into the 501st? Do you have a Stormtrooper size guide? What is my Stormtrooper Armour made of? Will my Stormtrooper Armour get sun-damaged? How do I clean my Stormtrooper Armour? Can the strapping be replaced? Are your armour parts interchangeable with other Stormtrooper suits? How do I go to the bathroom when wearing Stormtrooper Armour? Do you hire Stormtrooper Costumes? Yes, an order confirmation email will be sent to you as soon as you complete your purchase. Yes, as soon as your order is dispatched, you will receive an email with the tracking information for your purchase. It is important to the Stormtrooper Shop that you are 100% satisfied with your order. If you have any problems with your order, please contact us by email or phone as soon as possible. The purchased item must be returned within 30 days of receipt in its original condition and marked 'RETURN'. Once received we will offer you a replacement or full refund within 7 to 14 days (We do not refund postage and packing charges). Exchanges - If you wish to exchange an item, please return it to us as above, including your order ID and state clearly what you wish the item exchanged for (Please note we do not cover postage on exchanged items). Yes, We operate under the General Data Protection Regulations (GDPR) which came into effect on 25th May 2018. The information you provide to us will be held on secure Stormtrooper-Costumes.com servers. We only collect information about our users as provided to us during the registration or purchasing process, which you agree to supply to us as accurate. Information collected includes name, shipping address, billing address, telephone numbers, e-mail address, and Items purchased detail only. You have the right to withdraw your consent at any time. You also have the right to ask for a copy of the personal data we hold on our system. Stormtrooper-Costumes.com does not store your credit or debit card details on its servers, this information is held securely by PayPal. 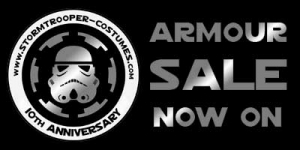 Stormtrooper-Costumes.com does not require you to create a Customer Account before you place an order; account information can be changed or removed by using your login and password. We accept all major international credit and debit cards and we use PayPal to process your payment securely. Please check the product listing for the delivery time for your specific item. All items are dispatched First Class post or Airmail Courier Worldwide. The Stormtrooper Shop cannot take responsibility for delivery times after we have dispatched your order. Please check the delivery times within the main product description of each product. We display prices in GBP (£), EUR (€), and USD ($). Your final order will be charged in GBP (£). Please note: Prices shown in EUR and USD are estimates relating to the exchange rate for that day, your final payment may differ by a fraction. Opening a customer account is not compulsory. 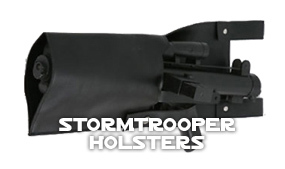 When you open a Customer Account, you can save time when placing an order, see the status of past orders and track them from within the Customer Account, and occasionally receive the latest news on products, services, and events at Stormtrooper-Costumes.com. We operate under the General Data Protection Regulations (GDPR) which came into effect on 25th May 2018. Account information can be changed or removed by using your login and password. Further information on all of the above and more can be found HERE. We would be happy to answer any questions you may have. Please email us by clicking HERE. We endeavour to reply within 24 hours, if not immediately. We have created a special page with information on this subject. 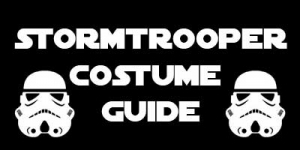 Do you have a Stormtrooper Costume size guide? Yes. Click here for more Stormtrooper Costume sizing information. Our armour is made from 2.5mm ABS white plastic. Will my Stormtrooper Armour get sun damaged? The plastic has been treated to protect the whiteness of the armour. However, prolonged exposure to direct sunlight will eventually cause yellowing. For general maintenance, we recommend baby wipes. For removing black marks, a small amount of WD-40 can be used. Absolutely. After purchasing a suit, we offer free Strapping for Life. Simply tell us what you need, and we will supply it, free of charge. You need only pay for postage. The bodysuit supplied uses a double zipper system for convenience. To use the toilet while standing, you can undo the crotch plate's strapping and open the lower zip on the bodysuit. The Stormtrooper Armour must be removed when sitting. 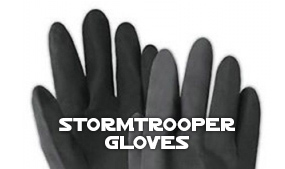 We do not hire or rent out Stormtrooper Armour Costumes or equipment.